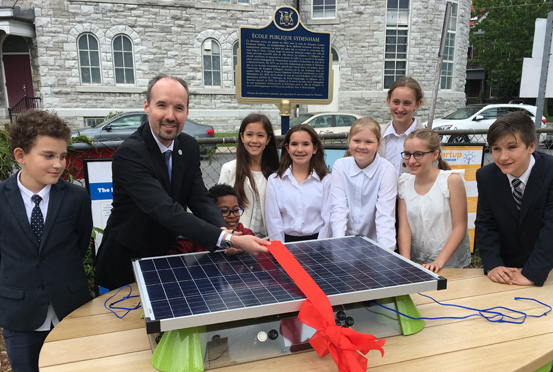 Mayor Bryan Paterson with Sydenham Public School student inventors of the USB charging table at their “pitch” event. Grade 5-8 students at Sydenham Public School are bringing an entrepreneurial mindset to the classroom and nurture students’ creative problem solving skills. Partnering with Innovate Kingston, St. Lawrence College, and Queen’s Engineering and Applied Science, students have taken an idea from the concept stage to completion, all while honing their critical thinking and problem-solving skills. Students are learning how to research an idea, overcome challenges, create a business plan and present a marketing campaign for their working prototype of an outdoor USB charging table. The charging table will combine solar cell technology with “pedal power” technology that will keep students active and allow them to socialize while charging their electronic devices. This project is funded in part by the Limestone Learning Foundation which funds special projects in the areas of Literacy & Numeracy, Science & Technology, the Arts, and Innovative Practices that enhance educational opportunities for students.